Current: What is the Aboriginal Quitline? 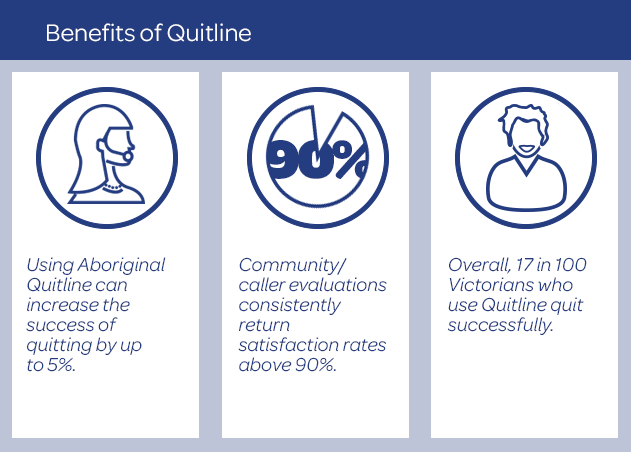 The Aboriginal Quitline is a culturally-sensitive, free and confidential telephone service providing customised assistance to help you with your quit smoking attempt. You can access the Aboriginal Quitline by calling 13 7848 and asking to speak to an Aboriginal Quit Specialist. Victorian Aboriginal Quitline has three Quit Specialists; Jamara, Tokerau and Glen. They have a range of backgrounds and skills while also learning more and more from each caller they speak to. Each Quit Specialist has the experience necessary to provide a culturally safe environment for the caller. This enables them to feel comfortable in discussing their smoking and other life circumstances which may be contributing to their smoking. The service is available 8.00 am to 8.00 pm Monday to Friday. Aboriginal Quit Specialists are professionals with comprehensive training to assist people with smoking cessation in a culturally appropriate way. They will provide callers with a plan for quitting that is tailored to their individual needs, as well as information on different quitting methods and products, and written and other resources. They can also link callers up with local support groups if requested. They can also call you back to provide further support and check how your quit smoking journey is progressing. Hear from our Aboriginal Quitline Specialists down below!